This magnetic hook features two strong magnets in the blue base. 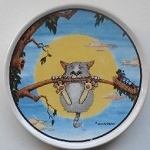 Place this magnet on any metal surface and use the cat's curled tail to hang potholders, signs, tools, notes etc. The hook is 2 3/4" wide x 1 1/2" high. Previously owned but in good condition.